Lego, always innovators in the toy industry, seem to have done it again. 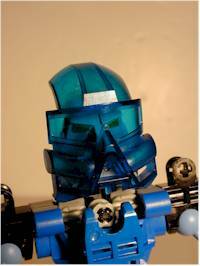 Their newest idea is called Bionicles, and it combines the ingenuity of building toys that has made Lego famous, along with the fascination with robots that little boys seem to never lose. 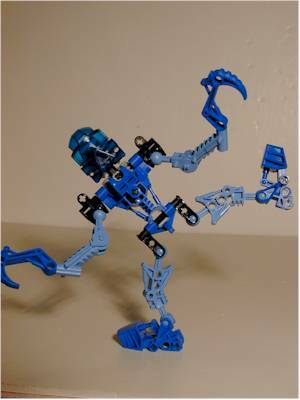 The web page www.bionicle.com is designed to give you some information on the concept and just who these mysterious robots are. But the story isn't a simple one, that I'll be able to wrap up for you in a paragraph or two - but I'll give it a try! These characters come from the island of Mata Nui. 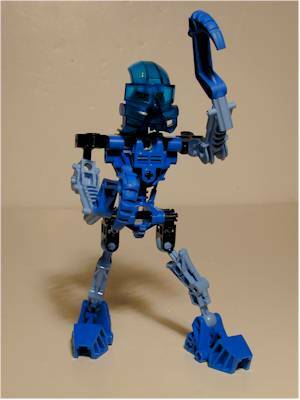 Mata Nui was a great spirit god, and he brought peace and happiness to the islanders called Tohunga. 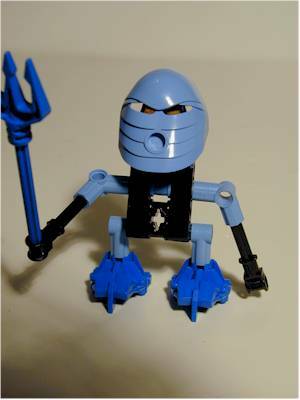 As is often the case, Mata Nui had an evil brother, called Makuta. Makuta cast a spell on his brother, sending him into a endless sleep, and taking over the island. 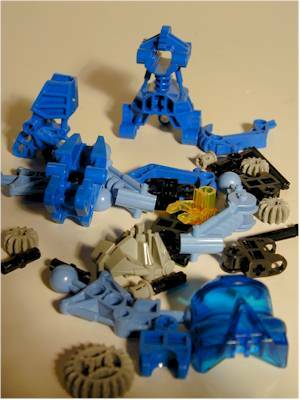 The Tohunga held out though with the legend of the Toa, who were heroes that would save them. There are six elemental figures, and these are the Toa. Each represents the physical embodiment of either water, earth, stone, air and ice. Each has a name, such as Gali, the Toa of Water, which I review here. These figures are around 7" tall when put together. There are another six figures, called Turaga and representing the 'priests', and each of these smaller figures is someone associated with one of the larger Toa. For example, Nokama that I review here is the protector of Gali's legend and story. By the way, these two - Gali and Nokama - are both the only females in the group of twelve currently available. The Turaga figures are about 4" tall. Each of the Turaga also has a 'follower', one of the Tohunga. These figures are also about 4" tall, and stand at the right hand of their respective Turaga. I haven't seen any of these figures in stores, and they may be the happy meal toys. The story is well fleshed out. Each Turaga also comes from a specific village on the island, and at the web site you can play a video game that involves moving around the island, solving puzzles and surviving dangerous situations. There is also an over arching story line involving each Toa collecting masks to enhance abilities and powers. And later we'll be getting a Gameboy and PC CD-ROM game. So what makes all this so special? Well, obviously the well thought out story, although the story line itself is fairly standard fair. But what I find most interesting about this line is that if it is successful, it will prove what no other company has been able to prove in years - that a toy line does NOT have to be derived from an already successful movie or TV license. This concept is a new idea, developed by Lego. While there will be other tie-ins, like the aforementioned games, fast food toys, etc. they weren't the driving force for the toys - it's the other way around. This line seems ready to become a huge hit, and combines the coolness of Legos with the fun of robots, and after hearing about these from several folks, I had to check them out. I purchased two as I said, a Turaga called Nokama, and a Toa called Gali. The Toa, being larger and more complex, cost about $7 at most stores. The Turaga each cost about $3. Considering the normally expensive Lego prices, these are much more reasonable. Don't worry, I'm not going to say anything about collectors here. These are true toys, and the packaging is designed for kids. The boxes for the smaller Turagas are standard Lego fair, but the rest of the priests are pictured on the back. The larger Toa come in plastic 'cans', with a double plastic sleeve around the outside. These sleeves have terrific graphics, and include 'mask codes' that can be used at the web sites to unlock various information and secrets. This is a great concept - tying the toys to each other and to other forms of media is an idea that has been attempted before, but never with this kind of complexity and ingenuity. I'm not a big robot fan, and since I grew up long before Micronauts or Transformers, the fascination with them has always left me somewhat confused. But these figures are just plain great toys. The designs of the big Toa include the ability to build them different ways and with parts from other figures, giving the children the ability to be as creative and imaginative as they want to be. They also have action features that work extremely well, far better than almost any action figures on the market. Gali has a series of connected gears that allow the kid to spin a gear on his back, and swing both his arms. The action is smooth and tight, even though the toy is intended to be built and taken apart over and over. The smaller Nokama has a rubber band powered arm swing that is powerful enough to toss his Trident half way across a room. The design of both these figures is great, and the overall design of the line leaves so much to the child's imagination that there is really nothing else quite like it. Articulation? Aren't these Legos? Why, yes, they are, but they are articulated Legos! The large Toa have terrific ball joints at the shoulders, hips and ankles, allowing for all kinds of poseability. The large feet and tight fit means that the figure doesn't just assume the position, he (or she) can maintain the position! Action figure designers should take special note of these great toys. The large Toa don't really have accessories per se, and the smaller Turaga and Tohunga figures do come with one accessory of some sort. So what counts under this category? The very cool masks! Each figure comes with a mask that is part of their overall figure. But there are alternate masks for each character, and mask packs can be purchased for a couple bucks that add another six masks. There are supposedly over 100 masks, and these will fuel the line by giving the kids something to collect, beanie baby like, in the line. It's another excellent concept that should prove very popular. Each of the Toa also come with a small CD-ROM that works with the web site and provides codes and information with the game. Lego is well known for high quality toys, and these are certainly no exception. The pieces fit together extremely well, and yet you can disassemble the figures and rebuild them in multiple ways without destroying them. The pieces are sturdy and well designed. Consider what you are getting and compare that to the average seven dollar action figure. I think you'll agree once you get your hands on one of these that they are a terrific value. As I said, I'm not a big fan of the older lines like Transformers or Micronauts. That means that if I like these this much that you should take the time to check them out. The concept is well thought out, the figures are well designed, and they've found a fantastic way to marry the imaginative building play of Legos with the active play of action figures. I have to hand it to Lego - they've hit a winner. Now I can only hope that they reap the rewards they deserve. If you have a child about 7 or 8 years old, don't expect to get a lot of time to play with these yourself. I bet they won't be putting them down for quite some time! In the bricks and mortar world, I've seen these at Toys R Us and Meijers so far. I suspect they'll show up at every retailer that sells Legos though, and it looks like Lego has huge plans for the line. 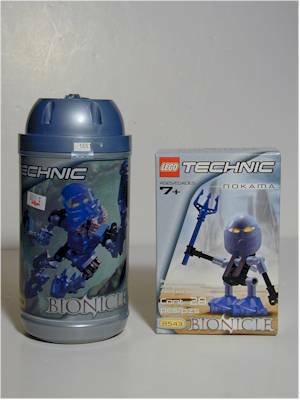 On-line, you can pick them up directly from the www.bionicle.com site. For a terrific overview of the entire line, with some excellent pictures of all the figures, check out Bobbi Boyd's site.